When you look at the top row of a normal smile, you'll see symmetrical pairs: the central incisors in the middle, flanked by the lateral incisors and the canine (or eye) teeth on the outside of them. Sometimes, though, teeth may not form as they should: in fact, it's one of the more common congenital defects with one in five people having missing or deformed teeth, often the upper lateral incisors. In the latter case, it's not uncommon for the eye teeth to drift into the missing lateral incisors' spaces next to the central incisors. This creates a smile even a layperson can tell is off. There is a way to treat this with orthodontics and cosmetic dentistry that will transform that person's smile while restoring better mouth function too. It's often a long process, however, that's best begun early and must be precisely timed with dental development. Using braces, we move the drifted teeth back to their proper positions, which will make room for a future dental restoration. It's usually best to begin this treatment during late childhood or early adolescence. The next step is to fill the newly-created space with prosthetic (false) teeth. Dental implants are an ideal choice since they're durable and life-like, and won't require permanent alteration of adjacent teeth. They do, however, require a certain amount of bone volume at the site to support them; if the volume is insufficient we may have to place a bone graft to stimulate new growth. It's also best not to install implants until the jaw has finished development, usually in the late teens or early adulthood. 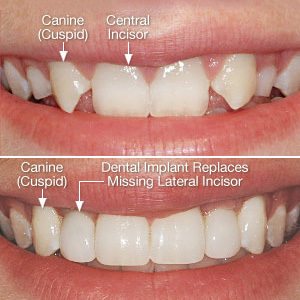 In the interim between tooth repositioning and implants we can customize a retainer or other removable appliance with a false tooth to occupy the space. This not only enhances the smile, it also prevents the repositioned teeth from drifting back. These steps toward achieving a new smile take time and sometimes a team of specialists. But all the effort will be rewarded, as a person born without teeth can have a new smile and improved oral health.